They have come to pray for the health of loved ones. They have come to ask for help to pass a tough exam, or to just get by in hard times. But mostly, they have come to be part of a once-in-a-millennium spiritual event: Saint Nicholas has come to town. 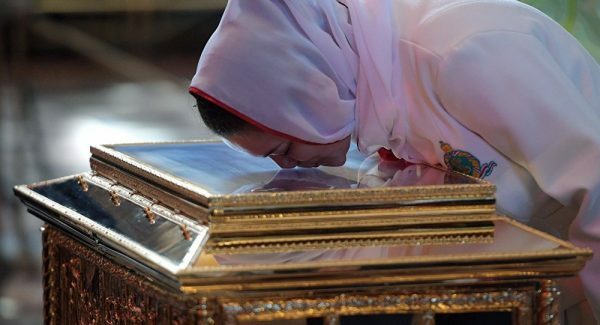 Since relics of Russia’s most beloved saint were brought to Moscow on May 21, more than a million people have waited in lines lasting as long as 10 hours to spend just an instant at the gilded ark that holds one of his ribs. This mass act of devotion provides a snapshot of how important the Orthodox Church has become to Russians’ contemporary sense of identity. Lines to see the saint Russians call “the miracle worker” have stretched up to five miles from the giant, onion-domed Christ the Savior Cathedral, a reconstruction of a cathedral demolished by the Soviets in 1931. Some waited to pray for a miracle to Saint Nicholas, whose life inspired the legend of Santa Claus. But for many, the arrival of the relics, on loan for the first time from the Italian city where they rested for 930 years, was in itself a miracle worth witnessing. What they see at the ark is an icon of Saint Nicholas under a panel of bulletproof glass, with a crescent-shaped opening in the middle through which the bone is visible. As priests and burly security guards look on, a choir chants a harmonious prayer that echoes through the cavernous, ornate cathedral. But the music is drowned out by the stentorian instructions of volunteers in fluorescent green vests. They warn worshipers to cross themselves before they reach the ark and to have their prayers ready, to avoid backing up the line. As soon as the faithful bend to kiss the glass, a volunteer grabs them by the shoulders and nudges them, usually lightly, toward the exit. Those who linger get a special shove and an order to move on. Another volunteer wipes the glass with a cloth. But if this brusque treatment bothered anyone, it did not show. People coming out of the cathedral on a recent Friday expressed something resembling a combination of bliss over what they had seen and relief that they had survived the ordeal. “We were so afraid we wouldn’t make it,” a pregnant woman said in tears, as her husband comforted her. More than 70 percent of Russians identify themselves as Orthodox Christians, more than double the number at the time of the 1991 Soviet collapse. Russian President Vladi­mir Putin, who has aligned his vision for his country as a bastion of conservative values with that of the Russian Orthodox Church, visited the relics the day they arrived in Moscow. Russia is slowly starting to come out of a recession, and people frustrated by low living standards or corruption-ridden government are always looking for somewhere to turn. About 2 million wrote letters to Putin for his annual “Direct Line” call-in show this month to ask for things such as higher salaries, better roads and improved health care. But people go to see Saint Nicholas not just because they are frustrated and hoping for a miracle that Putin can’t give them. The experience really appears to make them feel like they are part of something bigger. Russians have stood in lines by the hundreds of thousands to witness religious relics . More than 3 million people saw a belt thought to have belonged to the Virgin Mary when it came to Russia in 2011. But Saint Nicholas is special, said Maria Korovina, head of the Orthodox Church’s media center for special events, because of the role he plays in Russians’ lives — and the way these relics got here. Nicholas, who died in A.D. 343, was the bishop of Myra, which is now in southern Turkey. One legendary attribute that led to the story of Santa Claus was his habit of giving gifts in secret. Believers say his remains produce a liquid called manna, or myrrh, said to have healing powers. In 1087, Italian sailors spirited the bones to Bari, Italy, where the remains have been kept in a crypt ever since. The decision to remove a rib and send it to Russia was the result of a historic meeting last year between Pope Francis and Russian Orthodox leader Patriarch Kirill, the first such encounter since the 11th century Great Schism that divided Christianity. The remains will be taken to St. Petersburg on July 12 and returned to Italy at the end of the month. On a recent Sunday evening, as the line meandered along a fenced-off sidewalk on the Moscow River embankment, through well-guarded police checkpoints and past well-stocked food kiosks and portable toilets, people wrote down prayers for the health of their loved ones to while away the hours. Some fretted over whether they would get in before the cathedral closed for the night. But there was no need to pray for a miracle. The doors stay open until the last worshiper in line has made it inside.